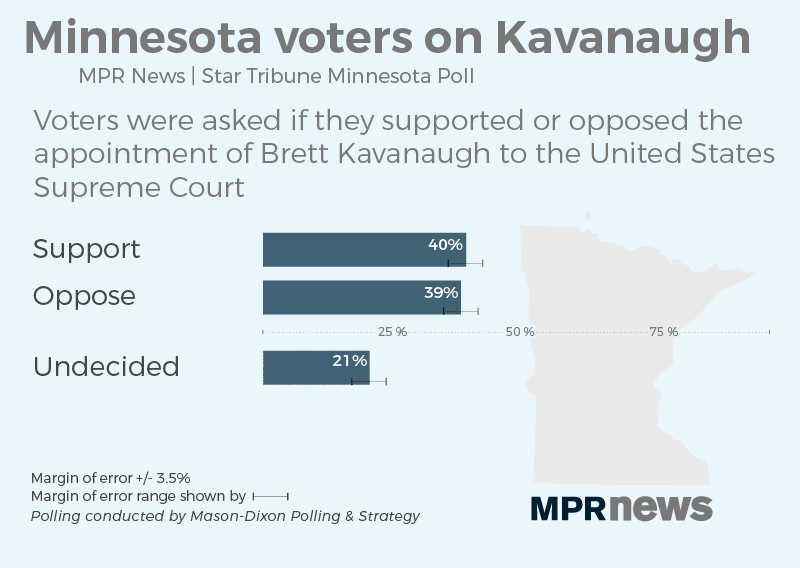 Even before sexual assault allegations surfaced against U.S. Supreme Court nominee Brett Kavanaugh over the weekend, Minnesotans were closely split on whether he should be confirmed to the nation's highest court. An MPR News/Star Tribune Minnesota Poll of 800 likely voters showed 40 percent supported his lifetime appointment, while 39 percent were opposed. The remaining 21 percent of voters were undecided about Kavanaugh, a circuit judge on the United States Court of Appeals. The responses demonstrate the stark political division over President Donald Trump's latest nominee. Republicans in the poll professed near-universal support for his pick, while three quarters of Democrats opposed Kavanaugh. Independents who were polled were split. University of Minnesota law professor Heidi Kitrosser is closely following the Kavanaugh nomination. She said she's not surprised by the poll results, especially given what's at stake. It's widely expected he would shift the ideological balance of the nine-member court toward conservatives. The new justice will replace Anthony Kennedy, who was a swing vote on many matters. "The balance of power on the court is really up for grabs," Kitrosser said. The Mason Dixon Polling and Strategy survey, which has a margin error of plus or minus 3.5 percentage points, was conducted between Sept. 10-12. That was before the Sept. 16 story published by the Washington Post naming Christine Blasey Ford, a California professor, who alleges Kavanaugh drunkenly pinned her to a bed and tried to disrobe her when they were high-schoolers at a party in Maryland in the 1980s. 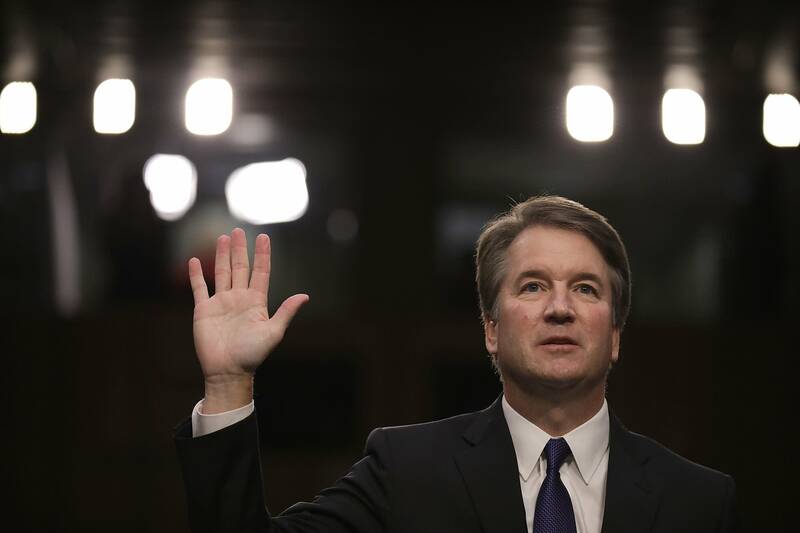 Kavanaugh is denying the allegations, and both he and Ford have indicated they are willing to testify in front of Congress, perhaps under oath. Democrats now want to postpone a vote on his appointment, currently scheduled for Thursday, until the allegations can be investigated. "For any nominee — whether it's for district court or a judge at any level — if a report like Ms. Ford's comes to light I expect it to be seriously investigated by the FBI before we vote," Minnesota DFL U.S. Sen. Amy Klobuchar said in a statement. Klobuchar sits on the Senate Judiciary Committee, which has an important role in vetting Kavanaugh before a confirmation vote. But Republican state Sen. Karin Housley, who is running for the U.S. Senate against incumbent Democrat Tina Smith, said the process in place to vet the allegations is through the Senate Judiciary Committee. "The hearings should continue and these questions should be asked during the hearings, that's what this process is for," Housley said. "These are serious allegations, sexual harassment and abuse is wrong in whatever environment it's in, and if there are accusations they definitely need to be heard and go through the process." She also criticized her opponent, Smith, for not seeking a similar vetting of allegations against U.S. Rep Keith Ellison, who is running for attorney general. In August, Ellison's ex-girlfriend, Karen Monahan, accused him of domestic abuse in 2015. "Her standard only applies when it's convenient for her politically," she said. "She said every woman should be heard, yet she continues to campaign with Keith." Smith, who opposes Kavanaugh's appointment, said she supports an FBI investigation into the allegations against him. "We are looking at a lifetime appointment to the United States Supreme Court," she said. "I think we need to take the time that we need," she said. She also pushed back on Housley's comparison of the Ellison allegations to the current situation surrounding Kavanaugh. "Ultimately, the people of Minnesota are going to make a decision about whether or not they want Congressman Ellison to serve Minnesota as attorney general," she said. "Their voices will matter. Judge Kavanaugh is being considered for a lifetime appointment to the U.S. Supreme Court, and the voters won't have an opportunity to decide for themselves. Congress really needs to fill our responsibility to provide advice and consent." If Kavanaugh is confirmed, many abortion rights supporters fear the new conservative majority will attempt to overturn the Roe v Wade ruling, the landmark Supreme Court decision that upheld abortion as legal across the nation. 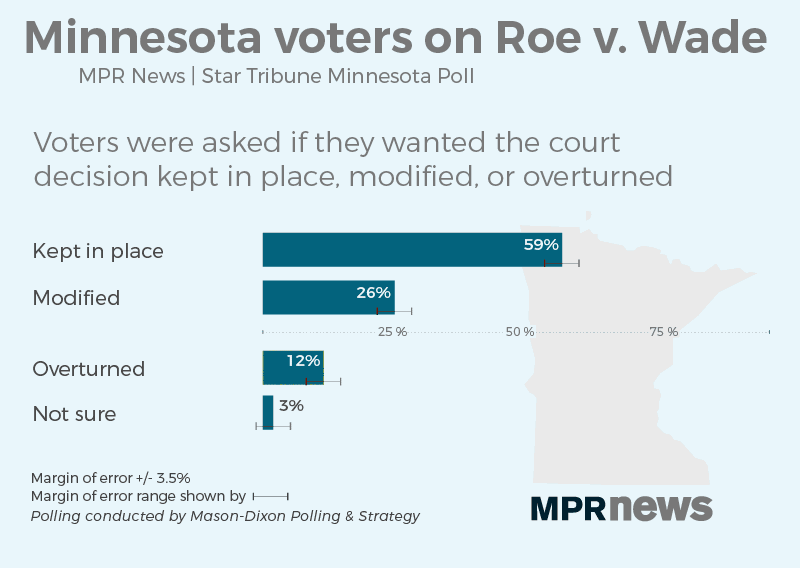 In Minnesota, only 12 percent of poll respondents said they favored overturning the court ruling. Nearly 60 percent said they want the law to be kept in place, while 26 percent said they'd like it modified in some way, and 3 percent were unsure. Respondents in every region of the state and every age group favored keeping abortion laws the same over changing or undoing them. The poll showed stark differences on the issue depending on what party the respondent was from, with 80 percent of Democrats wanting to keep abortion laws in place and only 28 percent of Republicans professing the same.